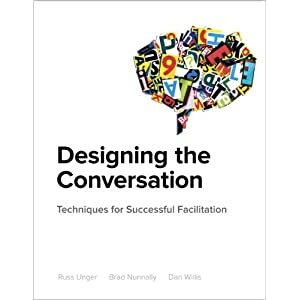 I’m knee deep in the writing my assigned chapters for Designing the Conversation (http://www NULL.amazon NULL.com/Designing-Conversation-Facilitation-Experiences-Voices/dp/0321886720). The one experience that has been the most enlightening so far is the act of editing. Not all content that gets written ends up in the final draft of the chapter. Rather than let this content simply fade away, I want to preserve it here on this blog. The context of this section is around determining when and how to ask the golden question “Why?” over the course of a facilitated session. The “Why?” question is a great tool for any facilitator, and one way it can be used is by vetting out participants personal agendas. Below is a section that shows how you can use “Why?”-type questions to get to the meaning behind comments, suggestions, and ideas that come from the participants of a session. Personal and organization politics are something every facilitator needs to deal with in almost every session they run. These politics can be very dangerous to a group’s energy, motivation, and willingness to participate. As the facilitator though, you are in the position to questions these politics that have most likely derailed things in the past. You can use the “Why?” questions described earlier in the chapter or come with you own to address the political issue directly, or find a way around it so it does not cause too much damage. Politics is not the only danger to a facilitated session. Participant’s personal agendas can create just as much havoc, if not more. It is your job to ensure these personal agendas get addressed and removed from the overall conversation. Asking “Why?” at just the right time and way can allow the group to either move past the comments of a certain participant, or self regulate it so that person’s agenda does not effect the overall flow of the session. Occasionally, a person’s political motives or their personal agenda might have something shiny hiding behind it. This could be the first time their voice has ever been heard, and they really want to get their idea, suggestion, or concern out there for the rest of the group to digest and react to. Naturally, these are difficult to spot. A skilled facilitator will be able to identify though when someone is pushing a certain angle versus when they are trying to express something that in the past has been suppressed for whatever reason. If done successfully, this is where true innovation and insight can be found.